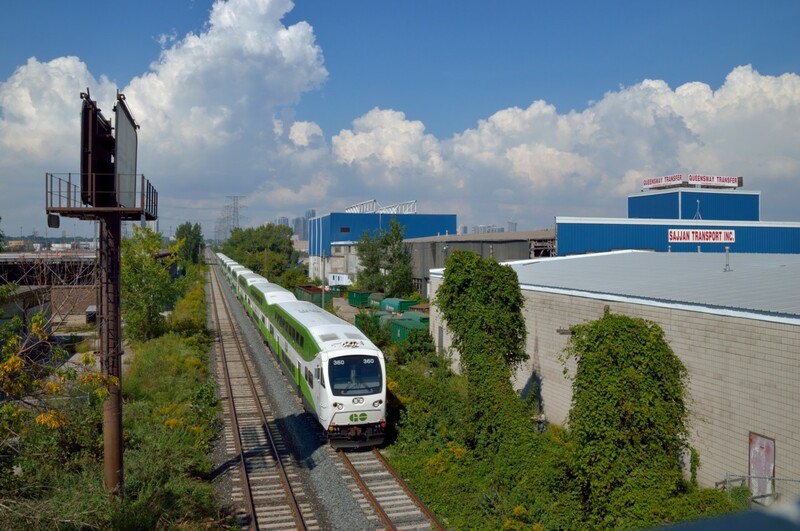 Railpictures.ca - Jacob Patterson Photo: Early in the process of rebuilding the Humber bridge on the Oakville Sub a GO Transit equipment move is seen passing through industrial Etobicoke on the Canpa Sub as it heads to the Oakville Sub to back into Willowbrook Yard | Railpictures.ca – Canadian Railway Photography – photographie ferroviaire Canadienne. Copyright Notice: This image ©Jacob Patterson all rights reserved. Clouds of summer in the background. What a great summer it was to be out watching and photographing railroad activity.